It is just a few days until the Midlands Championships at Darley Moor, promoted by Zepnat. The sign up has been huge and it is expected to be the biggest race of the year with top-notch competition travelling from far and wide. Darley Moor is almost entirely flat apart from a relatively short section of banking, but don’t get complacent – it can still be a technically challenging venue. That banking is used to great effect by the course designers and can require rapid dismounts, runs, and remounts to traverse unrideable sections… or maybe you are brave enough to risk the slippery traverse as, let’s be honest, there isn’t much more grip running with studded shoes. 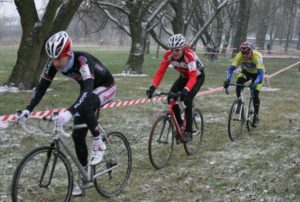 There can be tight turns on grass, mud, concrete, gravel and on many occasions, ice. If it is wet the terrain is unforgiving and a slog of a run or ride. Darley Moor has a well-earned reputation of being a windswept pocket of the arctic and so please come prepared with warm clothing and parents please keep an eye on the younger racers to make sure that they don’t turn into icebergs. If the forecast is correct, the ground conditions should be ideal being soft but relatively dry. There will be a water supply for jet washes (assuming it doesn’t freeze), commentary, and podiums for the crowning of the Midlands Champions. Some logistical notes: the starts will be gridded but please take note of instructions in the technical guide due to be sent out at the end of the week, as the fields are very large. Also note that there will be a parking charge of £2. Now, was it 2011 or 2012 when we had a dumping of hail and the soil eroded to leave a surface of sheet ice?… happy memories!